My my, it's great to be back. After a winter of isolation due to a multitude of mitigating factors, this past Friday I found myself returning to the world of the concerts, by way of legendary, seminal (but not legacy act!) grindcore masters Pig Destroyer. While our Brutalitopia cohort Jack ventured toward the Decibel Music Tour that was sadly the same day, my erstwhile colleague Mick and I headed to Reggie's Rock Club for an evening of musical cocaine that was a bit outside our comfort zone; longtime readers and casual viewers alike can attest that grind is not really a Brutalitopian forte. But sometimes a concert catches your eye and piques your interest and won't let go, and so you take that musical road less traveled. 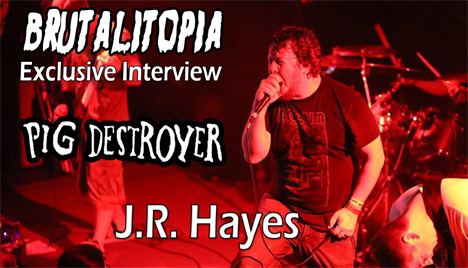 And how lucky for Mick and I that we did, because in addition to having our neck muscles sorely tested from headbanging, we were lucky enough to snag an exclusive two on one conversation with Pig Destroyer's immensely talented lyricist and vocalist J.R. Hayes. Check it out below to hear our conversation, during which we talk about Pig Destroyer's continuing evolution, touring and recording as a part time band, and the joys and wonders of conducting interviews under train tracks.